The title itself explains what the story is about. 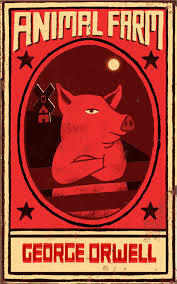 The novel is about the Revolution that happened by the animals in a farm in England, led by a clever pig named Napoleon. After they first chased their mean master, Mr Jones, 7 commandments has been written on the wall of the barn for the animals can see them. However, soon after the banishment of Snowball (pig that always opposes ideas from Napoleon ) from the farm, the commandments has been altered so that they would bring advantages for the pigs only. This matter happened with the help of Napoleon's seven scary dogs that terrorizes the animals and a pig named Squealer who spreads the propaganda by using the saying 'Napoleon is always right'. The animals had to witness their friends being slaughtered, starved, and so on under the tyrannical type of government led by Napoleon. I dislike the ending of this novel because at first , when I read this novel, I was bored to sleep and as soon as I read into the middle part, a sudden feeling of interest flooded my mind and was excited to see how marvelous the ending was. Unfortunately, the ending was not as bombastic as I hoped it would be. The ending depicts the idea that pigs and humans cannot be differentiate because they portray the same traits by gaining profits from others but themselves do not produce somethung useful.